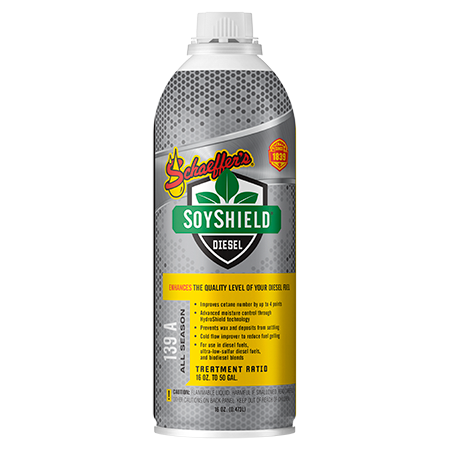 SoyShield® All Season is a concentrated, multi-functional fuel additive formulated for use in all types of diesel fuels, especially low sulfur and ultra low sulfur diesel fuels. Made from soybean oil, SoyShield® contains an additive package with friction modifying and detergency properties. This unique blend provides excellent wear protection and cleanliness for fuel injectors and fuel pumps. Using advanced anti-wax settling agents and cold flow improver, SoyShield reduces and safely disperses wax crystals from forming and clogging fuel filters and lines. Further blended into SoyShield® is our proprietary lubricity additive, SynShield®, which prevents fuel system wear and injector scoring for longer component life. SoyShield® meets the cleanup and keep clean performance as shown by the Peugeot DW10 Injector Depositing Test throughout the entire fuel system. SoyShield® is registered and meets US EPA requirements for blending into low sulfur and ultra low sulfur diesel fuels. Contains less than 15PPM sulfur. Boosts cetane number up to 4 points. Easier cold weather starting and reduced misfiring at lower air inlet temperatures. Optimizes performance and fuel economy up to 5%. Helps clean and control deposits, gums and varnish to restore and maintain performance. Inhibits oxidation during storage for better storage stability. Helps control acidic by-product produced by the combustion of diesel fuel. Strong wear protection for injectors, fuel pumps, supplemental rings and valve trains.